> JP Australia Wide Body 10'x33.5"
The versatility of the Wide Body SUPs make them popular amongst water sports enthusiasts of all ages around the world. Perfect for a social paddle with family and friends on rivers and lakes and for exciting sessions on the ocean. These boards are usable for every member of the family. Take your kids, your partner or even the dog for a cruise on flat water, or find some waves and exercise your first rides. Being rather wide makes them super stable platforms. 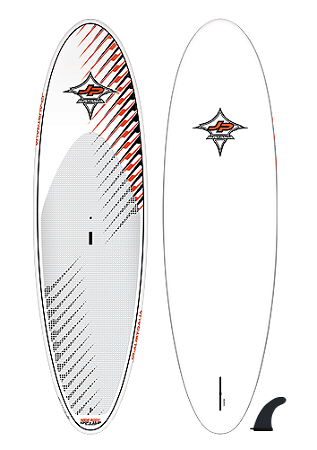 A great beginner and cruiser windsurf board. Novice SUP riders who have the urge of getting in the waves quickly pick the 10’0?. It is short and due to its 33.5? width, it is super stable. Instant fun and improvement is guaranteed. The short length makes it easy to catch waves and even steep beach breaks are fun to ride. PADDLER PROFILE You never ever fall off this one in flat water. The stability the board provides makes it a perfect family toy for every family member.